The situation in Turkey has calmed following an attempted coup overnight on 15-16 July 2016. The security environment, however, remains potentially volatile. Flights to, from and through airports in Turkey have returned to normal. Check with your airline or travel company if you need more information before you travel. 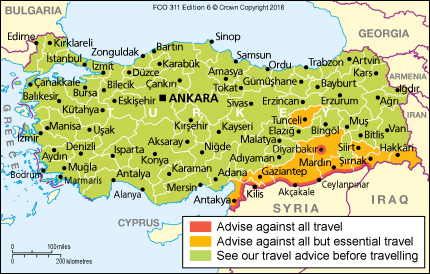 If you’re in Turkey, you should be vigilant, follow the advice of the local authorities, closely monitor travel advice and contact your airline or travel company for more information. In Istanbul and Ankara demonstrations may occur at short notice. You should be vigilant, particularly in areas where crowds may gather, and stay well away from any demonstrations. Take sensible precautions if you’re near any military or security forces. President Erdoğan has announced a state of emergency for 3 months from 21 July 2016. The state of emergency is focused on those involved in the attempted coup and isn’t expected to impact tourists. In some busy areas, especially Istanbul, the Turkish authorities are stopping members of the public to conduct ID checks. There is also a larger than usual number of police checkpoints on main roads across Turkey. You should co-operate with officials conducting checks, and keep your passport and a printed copy of your e-visa or your residence permit with you at all times. Security operations to detain alleged perpetrators continue across the country. You should take extra care in areas where security operations are taking place. Coastal resorts haven’t been affected by these security operations, but security force activity may be visible from some resorts. The FCO is aware of the situation regarding university employees. The presidency of the Higher Education Council has issued a revised note indicating that the restrictions on leave and travel don’t apply to foreign nationals. You should check with your employer directly before taking leave or making any travel plans as the implementation of the restrictions is subject to the discretion of individual institutions. Turkish and dual nationals are being asked to produce a letter from their employers and a social security document when leaving the country. These requirements may be subject to changes and amendments with little or short notice. Enhanced checks for Turkish nationals may lead to delays or long queues at foreign national desks. You may need to turn up at the airport earlier than normal to get through these possible delays, particularly at Istanbul Atatürk Airport. Over 2,500,000 British nationals visit Turkey every year. It’s generally safe to travel but you should take additional safety precautions; you should be alert to your surroundings and remain vigilant in crowded places popular with tourists. Since July 2015, demonstrations have occurred in cities across Turkey associated with renewed hostilities between the Kurdistan Workers’ Party (PKK) and Turkish security forces in south-east Turkey. Police have used tear gas and water cannon extensively to disperse protests. You should avoid all demonstrations.